← My blog is dead. Long live my blog. 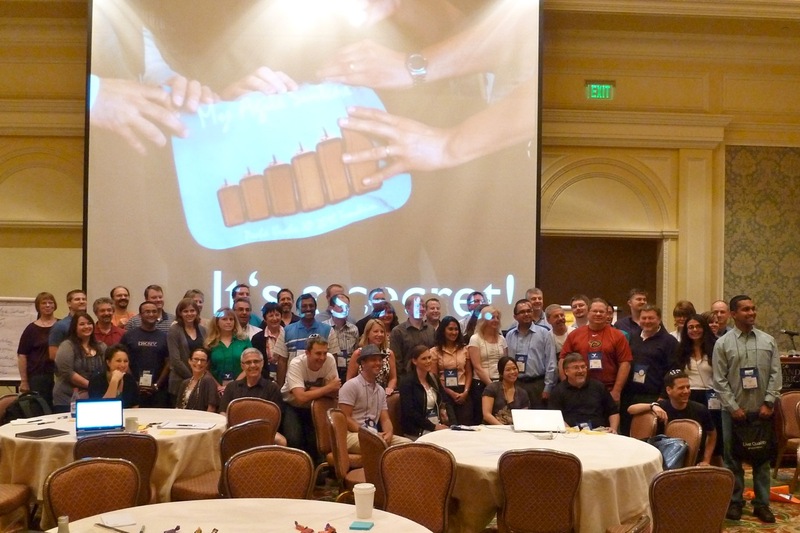 Last week at the Agile 2011 in Salt Lake City, Martin Heider and I hosted another session in the Pecha Kucha format. After WJAX 2009 and 2010 in Munich and XP Conference 2010 in Trondheim, this was the fourth event of that kind. This session was half a workshop and half a session format in Pecha Kucha style. Martin and I alternated between those two formats: a Pecha Kucha (audience is in record mode), then a few minutes interaction (audience is in play mode), then again a Pecha Kucha, then interaction, and so on. 90 minutes can be very quick. A Pecha Kucha is a special kind of presentation. A speaker’s presentation consists of 20 slides. Each slide will be shown for exactly 20 seconds, so that the presentation ends after 6’40 minutes (20 slides à 20 seconds). The speakers can order their pictures before the presentation in whatever order they want, but they can’t change the sequence during the presentation. The story for the workshop goes like this: A coach on an island (called Waterfall Island) once was in trouble. He called his friend on Agile Island, and his friend sends an armada of experienced coaches for help. Each of the coaches has an Agile suitcase full of precious methods and tools with what a coach needs to do what a coach has to do. We were honored that we had again a few experienced coaches in that armada and in Salt Lake City. They shared their secrets inside their Agile suitcases. Here they are with their marvelous pictures (hint: view them in fullscreen mode!). Portia Tung was the first on the stage. She carried the audience away with her passionate speech. Her theme was “Agile is a party!”, and so she did. Ole Jepsen just entered the stage afterwards, and he rocked the house with his awesome mix of great pictures, music, and he even worked a horn into his performance. His message was “Create Ownership”. Ola Ellnestam formed the armada’s rear light, but his light glowed very strong, since his 6’40 min were all about powerfull questions. I really liked his selfmade fotos, which gave the whole presentation a nice consistency. Iteration: A pair (two people) formed a group. 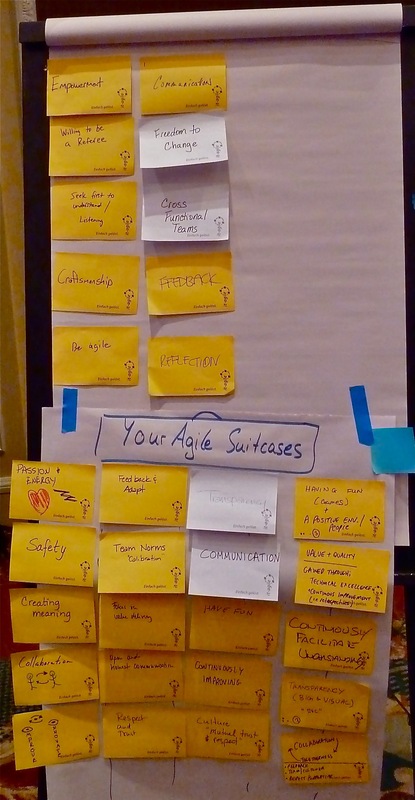 The group’s exercise was to come up with 5 items (no less, no more) they would put into their own Agile suitcase. What’s important for them regarding Agile? What are their most valuable tools, methods, things, whatever? Iteration: Two pairs (four people) formed a group. The group’s exercise was that one pair should show their 5 items to the other pair and vice versa, and after that to eliminate 5 items, so that again the group would come up with five of their most valuable suitcase items. Iteration: Two groups of four (8 people) formed a group. Same exercise as in iteration 2. Between the last two Pecha Kuchas, each group of 8 was asked to come on stage to present their Agile Suitcase to the whole audience. Here are the results. Afterwards we did a big group photo with speakers, audience and hosts. What a great session that was! Thanks everybody for attending, participating and energizing this session! P.S. : The feedback from the audience’s feedback forms of that session was awesome. Almost every attendee gave us best marks. Thanks again! 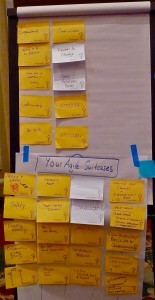 This entry was posted in General and tagged conference, it-agile-blog-planet. Bookmark the permalink. Wow. This looks totally awesome. I am sad that I missed it. I hope you will get invited to re-run it again sometime so I can attend. Thanks for the flowers :) We plan to redo it, but don’t know where or when yet. Will let you know if it’ll happen again.